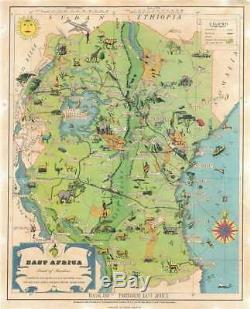 1954 Mathews Pictorial Map of East Africa (Kenya, Tanzania, Uganda, Zanzibar). WE SELL ONLY ORIGINAL ANTIQUE MAPS - NOT REPRODUCTIONS. Description: This is a rare 1954 Dennis Owen Mathews pictorial map of East Africa, including modern day Kenya, Tanzania, Zanzibar, and Uganda. Centered on the Rift Valley, which is colored in a darker green, the map covers from Lake Tanganyika to the Indian Ocean and from the Sudan/Ethiopia border to Ruvuma River. The map is clearly intended to promote East African tourism and give the impression of a playground of wonderful exotic beasts well-connected by a comprehensive transportation network. The map identifies many of East Africa's great game parks, including the Serengeti, Tsavo, Ngorongoro, Marsabit, and Selous, among others. Noted as well is Lake Victoira, along with its supposed lake monster, Lukwata. Throughout the great beasts of the East African's plains, elephants, lions, rhinos, giraffes, buffalo, zebras, and antelopes abound. Moreover, much of the regional transport network is illustrated. The road network, complete with 1930s style automobiles, winds its way between cities and Nature Pakrs. It also illustrates several early African railroads, including routes from Nairobi and Arusha (Mout Kilimanjaro) to Mobasa and Tanga, and the Kigoma âÃÃ¬ Dar es Salaam Route. This map was drawn by Dennis Owen Mathews, a Fellow of the Royal Geographical Society and general manager of the East Africa Tourist Travel Association and printed by Glen Freebairn of London. There are at least two editions, a large format edition issued in 1949, and the present smaller variant, issued with some updates, such as removing the Ground Nut Scheme lands, in 1954. It is rare to the market in all editions. Size: Printed area measures 14 inches high by 11 inches wide. Light wear along original fold lines. Verso repairs to fold separations. Text and printed images on verso. If your address is a P. DHL International EXPRESS (45 USD). We do not offer this service. Antique Map Restoration: Geographicus can repair and restore your antique map. Services include deacidification cleaning flattening and backing. The item "1954 Mathews Pictorial Map of East Africa (Kenya, Tanzania, Uganda, Zanzibar)" is in sale since Friday, November 23, 2018. This item is in the category "Antiques\Maps, Atlases & Globes\Africa Maps".